A box came yesterday. It's a tall box, about 3 feet in length. It was on the front stoop when I got home. The top was wet because it had starting drizzling about 2:30 and had continued off and on the rest of the afternoon. I couldn't remember ordering anything tall and thin. The only thing I have ordered is flat and rectangular. In looking at the return address, I see this is from my daughter. Huzzah! I know what's in it, but is it really that big? Opening up the box, I find a whole bunch of goodies. Yes, that's Jell-o. 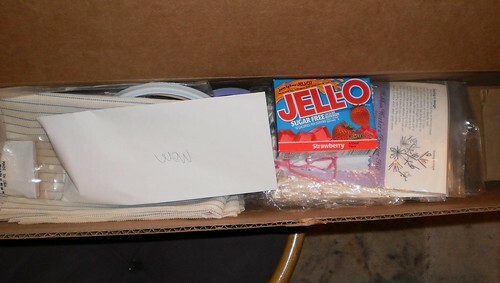 There was also a box of pudding and Jell-o's cheesecake in the bottom. There's Aida cloth, floss and threads, counted cross-stitch projects and ribbon embroidery kits. Carole's mother-in-law had the crafting supplies. She said her eyesight isn't as good as it was and this kind of thing is difficult for her now. She gave it all to me. I am so grateful. I've never done ribbon embroidery so I'm anxious to try this. I had a blast looking through everything, all the patterns and kits Kitty sent. And the floss is in gorgeous colors that just make me want to pick out a pattern and get started. I have to get my next project done first. In the very bottom was the object I knew was coming, a cane. This is a very nice cane with an adjustable length and what's called a 'shock absorber' at the base. I used it this morning and it will make standing up and sitting down so much easier. It doesn't remove the pain in my knees, but having something to lean on means I don't struggle to get up. Of course, since this is a box, it had to be examined. I never saw Mija in the box, although she might have checked it out while I was out of the room. She sniffed it when I brought it in and sniffed it when I emptied it. Now that it's been checked out, it's been ignored so I'll be able to recycle the box. Thank you, sweetie. We all got something out of that.